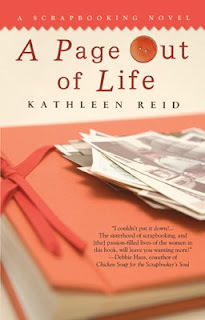 Then I read A Page Out of Life by Kathleen Reid. It is a great book! The main premise of the book isn't about scrapbooking itself, but more so about the way that this wonderful hobby can truly bring people together and how these friendships and the creative release that scrapbooking can bring can help a person through some of the toughest times. The novel focuses on several women which are part of a weekly scrapbooking group and the joys and sorrows of their everyday lives. I really found the characters the Reid developed to be very unique and complex in their own right, but yet could totally see the hobby of scrapbooking bonding these very different women together. I also found myself really relating to some of the women depicted in this well-written novel. This book would be a great gift for any of the scrappers in your life...but don't forget to pick one up for yourself as well! Before you rush out and buy a copy, you might just want to read a bit further. I have four brand new copies of A Page Out of Life to give away!! Yes, FOUR! So, over the next few weeks, I am going to be holding drawings using the Random Integer Generator and sending out one copy to four lucky recipients. How has scrapbooking enhanced the relationships in your life, either existing or new? Only one answer per person please. But if you'd like a way to double your chances to win, make a post to your blog about this giveaway (be sure to give them the link to this post and leave a separate comment here with a link to that post. Don't have a blog? You could also post a new thread in your favorite scrapbooking message board and do the same. I will except new comments through Wednesday, June 4th at 11:59 p.m. CST and the first random winner will be announced on Thursday. Be sure to check back for the announcement!